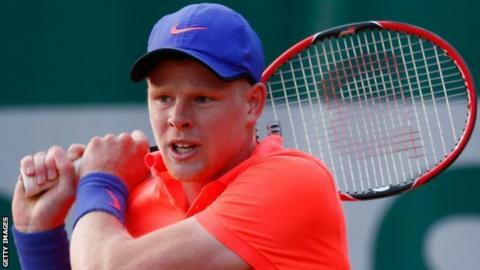 Kyle Edmund is fit to vie with James Ward and Dan Evans for a singles role in Great Britain's Davis Cup semi-final against Australia in Glasgow. The world number 100 suffered a fall in practice on Tuesday but a scan revealed no significant damage to his ankle and he could join Andy Murray in the team. "Fortunately, it's not serious," said Britain captain Leon Smith. "He did take a bit of a tumble on the court. He was able to hit today, pretty much pain free." Doubles players Jamie Murray and Dom Inglot complete the British squad, with the draw to be made on Thursday and final line-ups confirmed before play on Friday. Australia are led by captain Wally Masur, with Bernard Tomic and Thanasi Kokkinakis the highest-ranked singles players and Lleyton Hewitt and Sam Groth likely to play doubles. See how you can follow the tie against Australia across the BBC. No decision has been made, publicly or apparently privately, over whether Edmund, Ward or Evans will take the second singles place behind Andy Murray at the Emirates Arena. Edmund, 20, has never played a Davis Cup tie, but Ward - who won a dramatic five-set match against John Isner of the United States at the same venue in March - has lost his last 10 matches. Evans, ranked 300, was brought into the squad following the concern over Edmund and the 25-year-old has not been ruled out of contention, after a strong run of results on the second-tier challenger tour. "I'll go with my gut instinct," said Smith. "I've got some things in my own head to figure out and I'll talk to the guys." Hewitt is talking up the pressure on Andy Murray as he plays his final Davis Cup campaign. The 34-year-old plans to retire after the Australian Open at the start of 2016. Lleyton Hewitt won Wimbledon in 2002 and has won the Davis Cup twice - in 1999 and 2003. "A lot of the pressure is obviously on Andy," said the former world number one. "Whoever gets the opportunity to face him on day one really has nothing to lose." Murray, who took five days off on returning home following a fourth-round defeat by Kevin Anderson at the US Open, disagreed. "I wouldn't say it's all on me," said the Scot. "It's obviously Lleyton's last chance to win the Davis Cup - he'll be feeling the pressure as well. "We can point fingers at each other and say that there is pressure for certain individuals and none on others, but they'll be feeling the pressure as well. We'll see who handles it better over the weekend." Masur has his own selection issues after Nick Kyrgios, the second-highest ranked Australian, was left out of the squad by mutual agreement. Kyrgios is absent after agreeing with Masur to take a break, following a summer in which he made global headlines for on-court comments made to Stan Wawrinka about the Swiss player's girlfriend. "Nick has had a really full year, in more ways than one so far," said Masur. "We felt that, mutually, this was the best fit for him and the best fit for the team. And, to be honest, we look at Nick as a 10-year proposition." Australia have won the Davis Cup on 28 occasions, but not since beating Spain in 2003.